Despite the vast and growing literature on the economic impact of foreign direct investment (FDI), its social significance is somewhat a neglected issue. Focusing on Russia, this chapter examines the effect of FDI and (formal) institutions (proxied, alternatively, by the  accumulated stock of small and medium sized firms or SMEs and  number of economic crimes per 100,000 population or corruption) on (informal) institutional change (proxied by the change in the number of violent and property crimes per 100,000 population). The empirical findings provide robust support for a significantly positive direct impact of SMEs, whilst observing a significantly negative effect of corruption and either significantly positive impact of FDI or insignificant effect of multinational firms in this context. Evidenced by the research that has addressed locational choices of multinational enterprises (MNEs), foreign direct investment (FDI) has become a popular subject in the literature. This research has recently paid some specific attention to institutions as one of the key FDI determinants. Well-functioning institutions are critical to economic performance (North, 1989; 2005): they instil trust into firms and markets, helping firms to build innovation capabilities (Busenitz, Gomez, & Spencer 2000; Licht & Siegel, 2006; Lam & Lundvall, 2007; Mathews & Hu, 2007; Smith & Thomas, 2015a). Empirical evidence confirm that MNEs tend to invest in countries with strong institutions, or in places with (among others) lower degree of government intervention in business operations, lower level of corruption, better contract enforcement and property rights protection (Du, Lu, & Tao, 2008). Although FDI can benefit host economies, countries seeking to attract foreign investment can have undesirable outcomes (Alexeev & Pyle, 2003; Robertson & Watson, 2004; Kwok & Tadesse, 2006; Halmos, 2011; Petrović & Ranđelović, 2012). Indeed, the recent literature stresses the importance of bi-directional influence between firm’s decisions and institutions and addresses how firms shape institutional framework (Carney, Gedajlovic, & Yang, 2009). In particular, MNEs can act as “institutional entrepreneurs”, in that they may initiate change unintentionally by sharing business practices or by internalising their norms and professional standards (Kwok & Tadesse, 2006; Hardy & Maguire, 2008). Whilst positive change in local institutions caused by MNEs is possible, MNEs can increase social inequality (Halmos, 2011; Petrović & Ranđelović, 2012) and damage institutional quality (Alexeev & Pyle, 2003). For example, competition by MNEs for natural resources can increase the total supply of money (bribery potential), resulting in higher level of corruption and crime in a host country (Robertson & Watson, 2004; Kwok & Tadesse, 2006). This chapter makes a very first attempt to investigate these issues by contributing to the debate on the social impact of FDI. 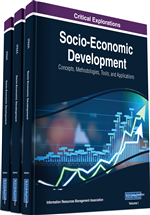 More specifically, its objective is to empirically examine the effect of FDI and (formal) institutions (measured by the (i) accumulated stock of small and medium sized firms (SMEs) and (ii) number of economic crimes registered per 100,000 population) on (informal) institutional change (measured by the change (to account for dynamism in the social environment) in the number of violent and property crimes) within a country. Russia provides an interesting context to achieve this purpose, with evolving institutions, slow growth in entrepreneurship and an increasingly recognised importance of FDI in technological catch up of the local firms (Smith & Thomas, 2015a). It is a suitable environment for a cross-regional approach. Russia is the largest country by land, with regions comparable in size to entire countries. This makes this research similar to a cross-national study. The number of regions across Russia is large enough to ensure considerable variations among them, while providing reliable statistical findings. Russia’s regions are diverse (in terms of language, ethnicity, culture and economic performance), while retaining comparable status within the country. Russia is heterogeneous both ethnically and religiously. It displays large and persistent regional disparities in social and economic characteristics, in spite of common policies, institutions and laws. Therefore, changes in these factors are not responsible for socioeconomic differences across the country, and this, in turn, substantially reduce the omitted-variable problems affecting many cross-country studies.